Can We Predict Treatment Success in tVNS? Transcutaneous vagus nerve stimulation (tVNS) has recently emerged as a promising treatment for depression and an effective mood enhancer, showing benefits over similar treatments including traditional vagus nerve stimulation (VNS) which is invasive and costly. 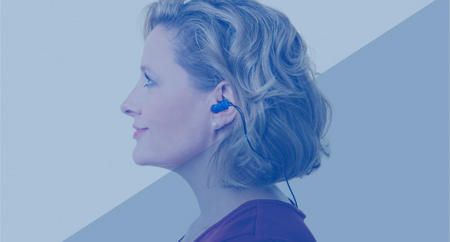 tVNS targets the auricular branch of the vagus nerve and works by applying a small electrical stimulation to the outer ear. The new non-invasive method has been shown to be effective in multiple clinical trials, but the technology could benefit from further optimisation of the treatment protocol. In particular, a clearer understanding of the changes in brain structures that could predict treatment success. Previous studies have reliably demonstrated the involvement of the insula as well as the thalamus and hippocampus. However, there is still room to further ascertain the relationship between brain region activation/deactivation by tVNS and treatment for depression. A total of 38 participants were involved in the study, 17 of whom received tVNS that lasted 30 minutes per session twice a day, 5 days a week for 4 weeks and the remaining 21 participants received a sham treatment. Consistent with previous results, tVNS treatment produced a more pronounced effect size on the outcome measure (Hamilton Anxiety Rating Scale). More importantly, the fMRI scans provided vital clues to decipher the mechanism of neuromodulation. This research showed that tVNS significantly reduced the symptoms of depression when compared to the sham treatment. This could be attributed to its neuro-modulating effect of vital brain connections known as the default mode network (DMN) that regulates mood and emotion. 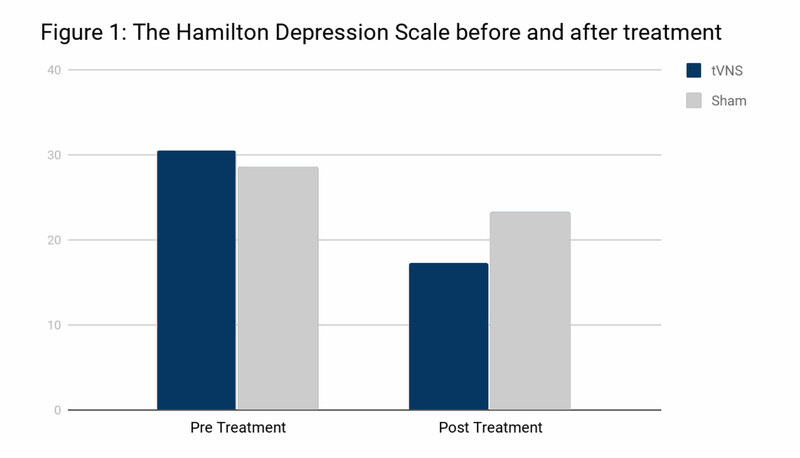 Patients who received tVNS scored significantly lower on the Hamilton Depression Rating Scale compared to those who received the sham treatment. Fig. 1. The graph shows a significant decrease in the HAM-D scores in the tVNS treatment group. Such a reduction was more pronounced compared to the sham group. fMRI imaging study of the participants revealed that more activation of the left anterior insula was detected in the tVNS group compared to the sham treatment group. The insula is a key brain region that regulates emotions and saliency processing and has been implicated in the pathology of depression. Caption: Activation map showing the brain region after tVNS stimulation. The region highlighted in yellow shows the left insula. These results are highly encouraging as they clearly demonstrated the role of the insula in modulating mood and depression that could also function as an early predictor of treatment success of tVNS. When both the behavioural outcomes (HAM-D scores) and the fMRI brain scans were examined together, the results strongly suggest that the beneficial effect of tVNS was achieved via the modulation of the left anterior insula activity. More importantly, such an association between insula activation and clinical improvement was evident even during the first treatment session. Such a unique characteristic implied that insula activation could predict the outcome (successful or failure) of tVNS treatment. This emerging evidence provides further support to the use of tVNS as a non-invasive mood enhancer and also an effective alternative clinical treatment for depression. This new data could pave the way for greater understanding and insight in the most effective use of tVNS therapy.